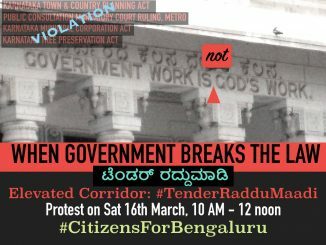 The Honourable Chief Minister Shri H D Kumaraswamy has responded to the citizens’ protest on March 16th demanding public consultations and #TenderRadduMaadi. This represented the interests of a large number of people, including over 60 organisations. His response was both swift and spontaneous, and at very short notice, he met with citizen representatives. He patiently listened to various points of view at the meeting and offered his own comments in the discussion with Leo Saldanha of ESG, Prof Ashish Verma of IISc, Prakash Belawadi, Naresh Narasimhan, Vinay Sreenivasa of Bengaluru Bus Prayaneekara Vedike (BBPV), Zibi Jamal of Whitefield Rising, and Isaac Amritaraj of Slum Janaandolana Sanghatane and, Srinivas Alavilli and Tara Krishnaswamy of Citizens for Bengaluru (CfB). At the end of the dialogue, he magnanimously agreed to hold wide ranging and open public consultations on the issue of mobility itself, including the proposed elevated corridor project before proceeding any further in the matter. The CM himself said that public transport is his priority and that he wished to develop Bengaluru as a high quality liveable city. He also mentioned that he is not committed to any one project or the other but that he is clear that this crisis is an opportunity for him to leave a legacy for a sustainable Bengaluru for many decades to come. He received Prof Verma’s mobility report and promised to personally review the document and alternative proposals. He also received the consolidated set of demands from the citizens’ protest, took the time to peruse it and promised to come to an understanding on how to proceed. The citizens’ representatives would like to thank the Honourable CM H D Kumaraswamy for his noticing public emotion and his genuine outreach. Srinivas Alavilli is a citizen activist based in Bengaluru, working on a variety of issues. He is the co-founder of Citizens for Bengaluru.